With the Thanksgiving holiday last weekend, there has been very little stitching going on around here. Instead, I had a full week of Thanksgiving planning, shopping, cleaning, baking and cooking. So much production for one meal! But, I have realized that I think I enjoyed the meal a lot more than those who just sat down and ate it, lol. You appreciate the details more when you understand what was involved! 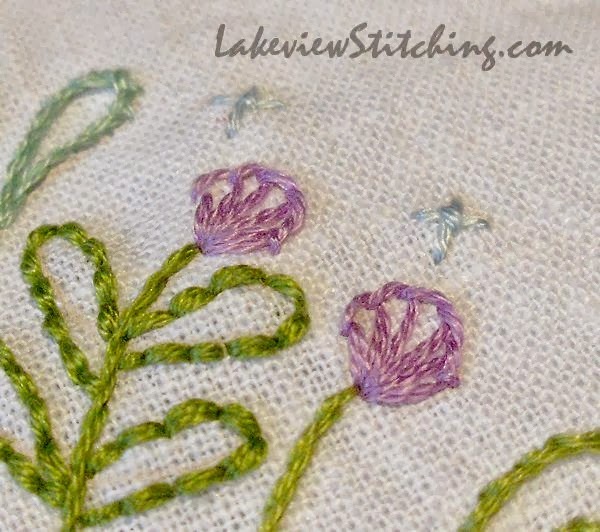 These little purple buds are just circles, but I stitched them in blanket stitch to give them a little more presence and tie them together with the flowers from last month. In the lower left corner you can see the remains of a failed attempt at this! But, I secured the thread so firmly that it is melded with the fabric. 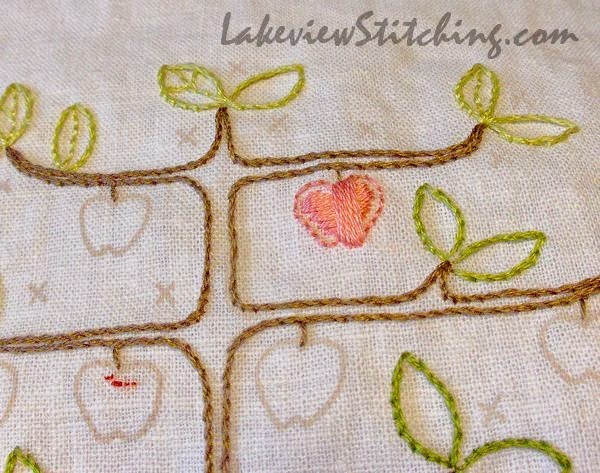 So, like it or not, I am now committed to satin stitch for the apples! But, I did find that the padding acts as a stabilizer and the fabric didn't pucker, so I think it will work out ok. Stay tuned! And, today I have managed to link up again with all the Canadian blogs for WIP Wednesday at The Needle and Thread Network. There's lots to see this week! your best friends block is lovely and like how you have changed the stitches on the flowers. The apples will be a challenge, I find that satin stitch can pull the fabric even when using a hoop, I am sure you will do them perfectly. Thanks very much, Margaret! I agree that the apples will be a challenge, and may need more than one try to get right. It is surprising, though, how helpful the padding and outline are. Even though the apple feels heavy, the fabric didn't pull on the first one I tried. It just wasn't very even, that's all. Your embroidery is very nice - keep making it your own. I wish I were better at it. Perhaps I should do more of it. Thank you for showing how you do the padded stitch. It looks like it could be a great technique. Thank you, Dolores! Yes, it is just practice. The photo doesn't show the first layer of padding, which was stitched vertically, and covered by the horizontal stitches you see here. Then the final layer is vertical again, which I've started in the photo. It uses a lot of thread! Beautiful! It is going to look stunning when finished. 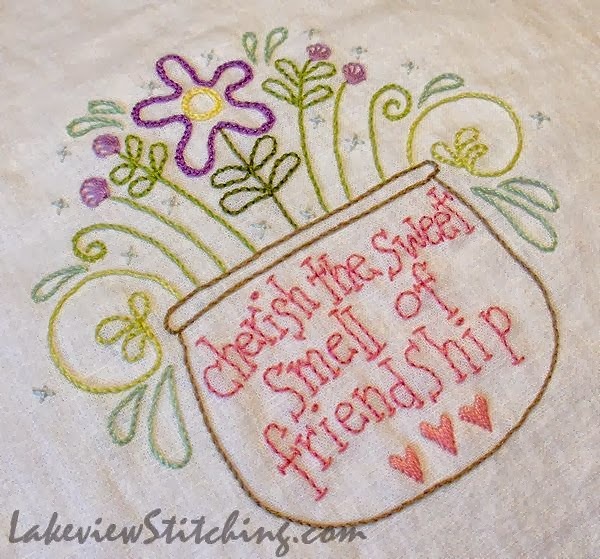 I love the sayings on your friendship stitcheries. I never thought of friendship having a smell, but as I read it I thought of cake, coffee, flowers. Your apples are going to be extra special! Thanks very much, Rachael! The sayings are nice to contemplate, aren't they? I sincerely hope the apples will turn out, I've been procrastinating on them a bit! Lovely stitching, and you have a great philosophy about cooking big meals! I like your new elements and the colours are good -very harmonious!